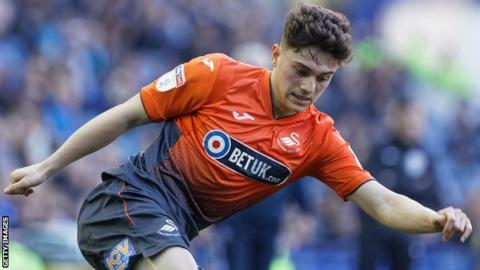 Swansea City are struggling to agree a new deal with Daniel James because of an issue over a possible buyout clause. The Swans are keen to tie down James, 21, with his current contract due to expire at the end of next season. But they are making little progress in negotiations with the Wales winger's representatives. A key sticking point is what Swansea feel would be an unrealistic buyout clause, with a figure of just £4m being mentioned. James came close to joining Leeds United on loan with a view to a permanent switch in January only for Swansea to pull out of the deal at the last minute. James had a medical at Elland Road ahead of the proposed loan move, which would have become permanent in the summer dependent on the Yorkshire club winning promotion to the Premier League. The former Hull City youngster has since produced the best form of his career, turning in a string of impressive displays for club and country. He scored his first international goal in Wales' 1-0 victory over Slovakia in their opening Euro 2020 qualifier. As a result, there is a growing feeling that he will land a move to the top flight this summer regardless of his contract situation at the Liberty Stadium. Nevertheless, Swansea are hungry to agree a new deal with James, even if it is only to give the club more bargaining power when the transfer window opens at the end of the season. James, currently one of the lower earners in Potter's squad, would receive a massive pay rise should he agree fresh terms. Sorting out James' situation is a priority for new Swansea chairman Trevor Birch, who officially starts work later this week. When asked last week whether he expects James to sign a new deal, Potter said it would be "up to him and his agents". However, talking before Swans' Championship game with Brentford on 2 April, the manager said selling players was not inevitable, but some could leave as Birch takes the reins. "It's a constant challenge to fix the economic challenges a club with a limited turnover - taking away the Premier League money - has in the Championship," he said. "He (Birch) needs to come in and help and restructure that."